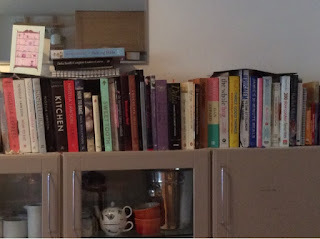 My other guilty book mania focuses on cookery books. I am a total addict and always fall for a beautiful book of glorious photos, without really paying attention to the recipes. I have loads piled high in the kitchen and it's getting to be a problem. But I have admitted I have a problem, and that is apparently the first step on the road to recovery-although to be honest I'm not sure I want to recover as I love my books and no one is getting them off me! However, it does seem silly that I have all these cookbooks which do get read a lot, but I haven't actually tried the recipes out, which is their purpose after all. My sewing books get read and the patterns and techniques used a lot, not so much now my health is poor but they have all had a good use, so I don't feel so bad about them. But I know that some of my recipe books may have had only one recipe used from them, or sometimes none at all! So before I'm allowed to buy more recipe books, I have to properly use the ones I have... I should also use some of the stacks of cooking magazines that I've also accumulated over the years. I'm nearly as bad at hoarding them as I am recipe books! So out with the baking tins and mixer it's time to bake and cook- watch this space for my attempts to justify my cookbook bibliomania!